Large, gnarled oaks stand guard in the Cowichan Garry Oak Preserve (CGOP), weathering the wind and rain of West Coast winters. They provide shelter for gartersnakes, black-tailed deer and a variety of birds. 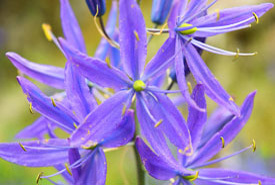 In the surrounding meadows, bees hum around native wildflowers and plants, such as camas, chocolate lily and Howell's triteleia. Meanwhile, a small creek bears fish through a stand of mature Douglas-fir and down to the Quamichan wetlands. There, at the edge of Quamichan Lake, rest flocks of migratory birds and tree frogs nestled in the branches. These trees were once common throughout southeastern Vancouver Island, the Gulf Islands and down through the Puget Trough of Washington State and Oregon's Willammette Valley. However, the spread of urban and agricultural development in the last 150 years has eliminated these Garry oak ecosystems to less than five per cent of their historical extent. The Cowichan Valley is widely known as one of the last and best havens of the globally endangered ecosystem and its biodiversity. The Cowichan Garry Oak Preserve occupies a vital part of this ecological tapestry. Since its establishment in 1999, CGOP has been a hub of activity for both restoration and research work in the Cowichan Valley. The ongoing and enthusiastic support from the local community continues to ensure the vitality of this precious conservation area. While so little of this ecosystem remains in a natural state, more than 100 species at risk still depend on it. Garry oak ecosystems support the highest diversity of plants in coastal British Columbia. They also support a high diversity of insects, reptiles and birds. The complex structure of these woodlands and meadows creates a variety of habitat. The area supports species such as Cooper's hawk, great horned owl, yellow montane violet and more than 100 types of native bees. In 2012, the Nature Conservancy of Canada (NCC), along with partner groups the Garry Oak Ecosystems Recovery Team and Cowichan Valley Naturalists' Society, embarked on a landmark reintroduction project for the western bluebird. CGOP was the first site of translocation. The groups brought this native bird back to areas where it disappeared in the mid-1990s. In the intervening years, the bluebird population has continued to rise. This has charted a hopeful course for the many endangered species in the region. 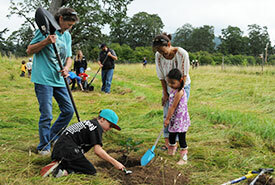 Garry oak meadows have been integral to the First Nations of the Cowichan Valley for thousands of years. Camas was cultivated in the meadows and harvested in late summer for its bulb, which is rich in carbohydrates and was pit-cooked or dried and ground up to make a flour. In order to ensure the vibrant blue-purple flower thrived, Indigenous communities worked with natural systems. 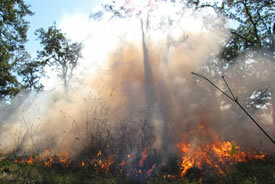 At times they performed prescribed burns to limit shrubs and conifers from expanding into meadows with deep soil. CGOP is NCC's flagship property in the Cowichan Valley. The site was originally the family estate of Scottish pioneer Gerald Erlam Elkington. NCC's purchase of the land in 1999 marked the beginning of the organization's long-term relationship with the area. Made up of the Cowichan Garry Oak Preserve and Quamichan Garry Oak Site (acquired in 2001), the conservation area encompasses 81 acres (33 hectares) of colourful meadow, forest and wetland ecosystems. 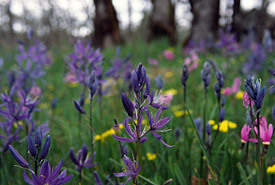 Each spring, the preserve is opened to the public for a unique opportunity to wander through the Garry oak meadows at the height of the wildflower bloom. Normally closed to the public in order to protect the sensitive ecosystem, the In Bloom Wildflower Festival is a once-a-year invitation to enter into the heart of the preserve and celebrate its beauty. The sub-Mediterranean climate of the Cowichan Valley creates an ideal location for vineyards, pastures and recreation. As a result, it attracts ongoing residential building. Development is active and widespread. Human use has compromised the health of the estuary and diminished the area's wetlands. Introduced invasive species, such as non-native grasses, Scotch broom and thistle, frequently out-compete the more fragile native plants. The suppression of natural fires favours conifers. These trees begin to encroach on meadows if left unmanaged. Volunteers have been instrumental in restoring the Cowichan Garry Oak Preserve, which only 10 years ago was choked by Scotch broom and other invasive plants. Today the meadows bloom with camas, shooting star and other wildflowers. 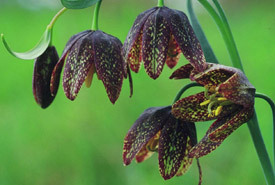 The native plant nursery, tended by volunteers, supports the ongoing stewardship of this special place. With only pockets of Garry oak ecosystems remaining, the species that rely on them are in rapid decline as well. Scientists are scrambling to understand the intricacies of these ecosystems and the vast complex of plants and animals found in them. A growing roster of scientists from across North America is flocking to CGOP to study at this “living laboratory.” Their work contributes to NCC's and other organization's ongoing efforts to restore Garry oak ecosystems in the Pacific northwest. Research includes Elizabeth Elle's ongoing work on bees and pollinator communities, which she has also written about on the NCC blog, LandLines. NCC thanks these committed ecologists for their dedication to the science that forms the foundation of NCC’s Garry oak stewardship and restoration efforts. Land stewardship funding was provided in part by the Habitat Conservation Trust Foundation.